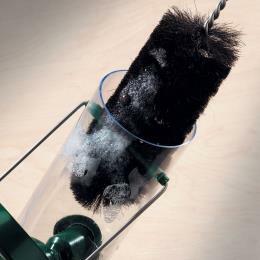 Brush off debris every time you put out fresh food and scrub the table with a mild disinfectant solution every few weeks: more frequently if sick birds visit. Move the table from time to time to stop the accumulation of droppings underneath. Some bird diseases can be transmitted to people. Although the risk is small, it is always worth taking sensible hygienic precautions. For example you might use gloves if you have any cuts on your hands, and thoroughly wash your hands after cleaning bird baths and bird tables. Annual maintenance is best carried out in autumn. 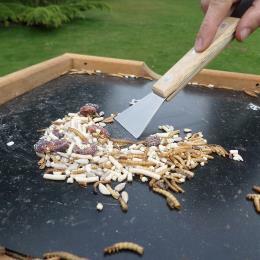 Clean your table, tighten and replace screws and make sure it is still a safe place for birds to feed. Don't expect a wooden bird table to last for ever. As it weathers, it becomes more difficult to clean, so in time you may find you need to make or buy a new one. Cats and squirrels can be pests on a bird table. Cats keep the birds away and squirrels eat the food. Although unsightly, 1.5" (4 cm) wire mesh around the table can stop squirrels and cats, but it will also keep away larger birds such as thrushes, woodpeckers and jays. An alternative is an inverted biscuit tin fixed at the top of the post supporting the table. This can stop cats and squirrels from climbing up to the table. 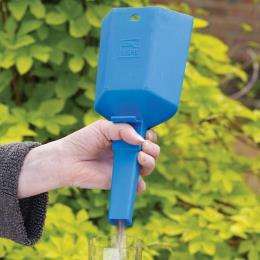 You could also try plastic bottles, fixed so they revolve, slipped along the post. Starlings, house sparrows, collared doves and the crow family may monopolise a bird table. An overhanging roof may deter larger species but you are unlikely to stop them feeding altogether. Provide food in several places, which should at least give other birds a chance. Break food such as bread into smaller pieces so that large pieces cannot be snatched and carried off. Put food on the table, on the ground and in a variety of feeders (spreading food over a large area reduces squabbling). Loose food should only be sufficient for a day, to reduce the chance of attracting vermin at night. If pigeons increase, discourage them by containerising all food: high numbers cause problems.